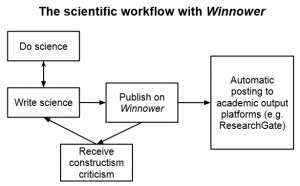 The Winnower | How to integrate Winnower, blog posts and ResearchGate? I argue that traditional scientific publication is extremely costly and that scientific publication must move towards more rapid publication practices. I discuss how this might be accomplished by integrating blogposts, The Winnower and ResearchGate. There are a number of important dimensions that scientists consider when they choose how and where to publish their work. One thing is publicity, aka getting others to read your work. Generally, scientists have relied on high impact journals to ‘make waves’, but they are increasingly using other routes such as ResearchGate, Twitter, blogs and so on. Aside from seeing them in the references, most new papers I read, I find via Twitter, Google Scholar (by looking up a specific researcher or because I get alerts on new publications) and ResearchGate. Very few are found via journal sites. Scientific publishing is changing. It is returning more to the root verb, to make something public, as opposed to publishing as in the publishing industry. The reason is obvious: the internet has made it possible to side-step the middle man entirely. Publishing no longer requires printing stuff on paper. Publishing is near-free. This is the same change that is happening to the recording and movie industries . The other part of sciencing is getting academic credit. Right now this is primarily measured in publications and their citations. However, alternative ways of measuring publication impact are growing fast, named altmetrics. Traditional pre-publication peer review serves a dual purpose: 1) it solves the credit problem: published articles count and so do their citations in journals, and 2) it gives you publicity. Researchers pay a price for this solution. Publishing is slow, very slow. Typical time spent in peer review for popular journals is often around 9 months (in psychology at least). This is a 9 month delay on science being shared with others. Imagine if emails were 9 months delayed. Engineeringly speaking, this is a crazy inefficiency. We can do better. We need to build a better scientific system for work flow. There are various proposed solutions. We are currently experimenting with open forum reviewing, which has been noticeably faster so far. However, it may not be just fast enough given that some scientists publish more much than others [1,2]. In fact, in a huge dataset of publications covering 9 years, about 70% of scientists published only a single paper. In another dataset, only 1% of scientists published a paper every year for 16 years in a row. These super-scientists publish 42% of all papers and reap 87% of all citations. Clearly, there are some large differences between scientists. It seems prudent, therefore, that we avoid slowing them done by slow and burdensome peer review . The above solution relies upon the PDF format. A PDF is basically an image of a paper with searchable text (sometimes!). It artificially divides text into ‘pages’ even for text where there is no intention to ever print it on A4-sized paper sheets. In general, a PDF compares poorly to HTML. HTML can embed interactive figures which I think will be very big in science in time to come. Probably, the PDF format will get changed so as to accommodate some new things, but it cannot keep up. PDF is an anachronism. But then, how shall we automatically export output from blogs/Winnower to ResearchGate etc? We need something citeable, maybe with a DOI . We need some kind of unit of scientific publication. A unit that isn’t a PDF. It needs to be a format that can handle moving images, interactive figures and sound. For practical purposes, it should be packed into a single file. A kind of stand-alone copy of a website. One could save the page, however, this does not produce a single file (try and see). One could take a screenshot of the entire post/article/page (a distinction to become more blurred/nonexistent in the future). This however would make it unsearchable. Perhaps some kind of format can be found, otherwise it must be created. Before we go there, some problems need to be fixed. Right now, Winnower posts that have not been finalized do not receive a DOI. They don’t even show citation information. To get these, one needs to finalize the post. However, this freezes it, so no future changes can be made. This needs to change if possible, so that it is citeable from the beginning. Otherwise we are introducing a delay again. Science can move faster, if we let it. The link goes to the PDF file, not the superior HTML version. The description is automatically generated and inserted, and is as a result often nonsensical. The chosen text is not even from the beginning of the post. No journal information is indexed. This may be a bug. We cannot seem to get this to work for Scholar with Open Psych even though we use Google Scholar’s own metatags. The images are not hosted on Winnower, but link to the blog. This means that if the blog goes down, so do the images. The content is not properly persistent in its HTML form (PDF will be, I guess). Server space wise I see why they may have gone with this solution. However, for persistence, it must be changed sooner or later. The Winnower article does not link back to the blog source. Some of these problems may be because Scholar indexes the unfinished version. There are formatting problems when converting from WordPress. If one uses the WordPress ‘pre’ style, and blockquotes, Winnower ignores this and instead produces a wall of text like in this publication . All in all, publishing on Winnower is an interesting gamble for an up-and-coming researcher. It is not known much how credit (older) colleagues will give for content not published in legacy journals. If Winnower fails for whatever reason, one might have ‘wasted’ a lot of good scientific material that could have been used to write old-school papers to send to legacy journals, as well as precious time. For this reason, Winnower will probably attract quite a number of mavericks in the beginning. Every time someone does something like this, fringe ideas spring forth (some of mine are fringe compared to public opinion). This is not necessarily bad, as long as they do not take over. For a project like this to work, it must be shown that it can work just like the regular system does, with regular type science. Only then will the more cautious, risk-aversive or conservative mainstream scientists follow (or die). 1. Ruiz-Castillo, J., & Costas, R. (2014). The skewness of scientific productivity. Journal of Informetrics, 8(4), 917-934. 2. Ioannidis, J. P., Boyack, K. W., & Klavans, R. (2014). Estimates of the continuously publishing core in the scientific workforce. PloS one, 9(7), e101698. 5. Kirkegaard, E. O. W. (2015). S and G in Italian regions: Re-analysis of Lynn’s data and new data. 6. Kirkegaard, E. O. W. (2015). Indian states: G and S factors. 7. Engström, C., & Falkvinge, R. (2012). The Case for Copyright Reform. COI: I am the founder of The Winnower so I am biased in that I think it is awesome. With that said, I also think there is tons of room for improvement--much of which is outlined in this paper by Emil Kirkegaard. Science publishing is changing with the advent of the Internet and social media, much like it has changed in other industries. The high costs and long delays of publishing are really increasingly being recognized as an impediment to scientific research and discussion, not a necessary gatekeeper. Indeed, classical peer review for the most part does not detect major errors in papers (http://dx.doi.org/10.1186/bcr2742). Kirkegaard outlines a future roadmap of publishing. This is very much in line with what we want to do with The Winnower and we hope that more users will follow the path and example he is setting with each publication. 1.) PDFs are really becoming outdated and as we continue to add features and think of new ideas we become increasingly disenchanted with them. Perhaps, as new types of content becomes publishable and valued, PDFs will soon disappear. 2.) Google Scholar indexing does need to be improved. We'll work on that! 3.) We are releasing an update to our plugin today (3/16/15) that will fix many of the small issues you bring up in your paper. -We will save/host the original image so that if the blog disappears all images are not broken. -Links back to the blog will now be displayed on the side of papers. - Many styles will be improved, including displaying tables and code. As more and more publications become available we can see what authors are using and make sure we cover that. Indeed, we still need to work on displaying math equations better. I hope you'll keep publishing with us and continue to point out where we can improve, because that is how we improve. Thanks again for submitting with us and hopefully we can continue to improve science publishing so that we may improve science. I recommended you to get this web address and comes to know about this most useful how to find my wifi password on windows 10 online tutorial and learn the process to view WiFi passwords.